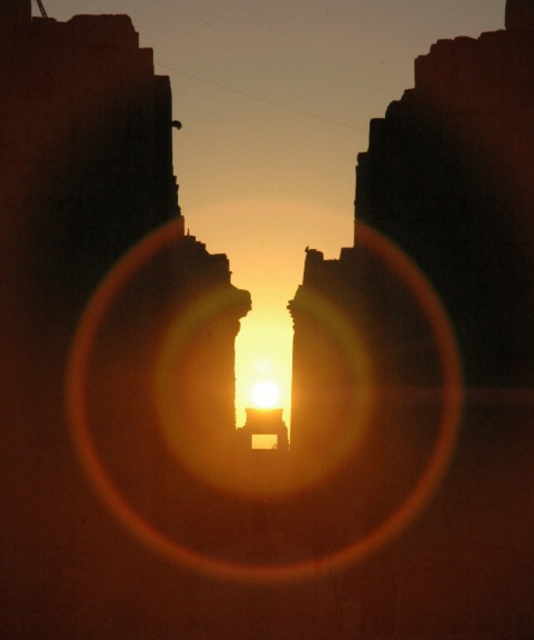 It seems like an awfully long time since I launched this winter AJE design challenge and I have to say I would like nothing more than to see some sustained sun right now… so far winter in the UK has be unrelentingly grey and wet! 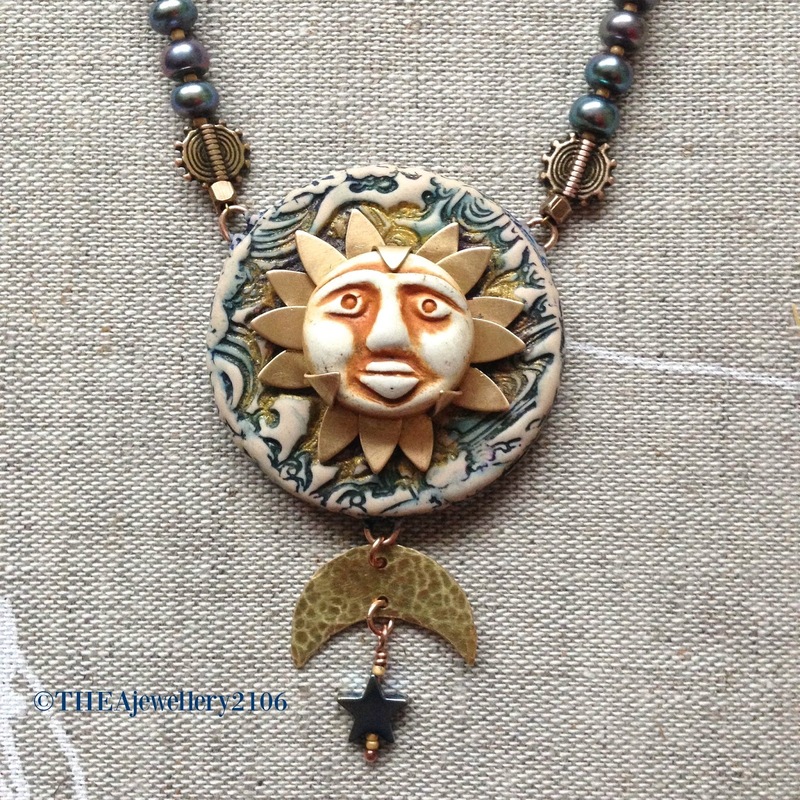 But never mind – a blog hop of designs with a sun theme is a pretty good substitute and if you missed the original post you can find it here. I have to admit that although this theme was my choice it did give me something of a challenge in that I struggle to work with yellows…a bit of a hinderance when it come to the sun. 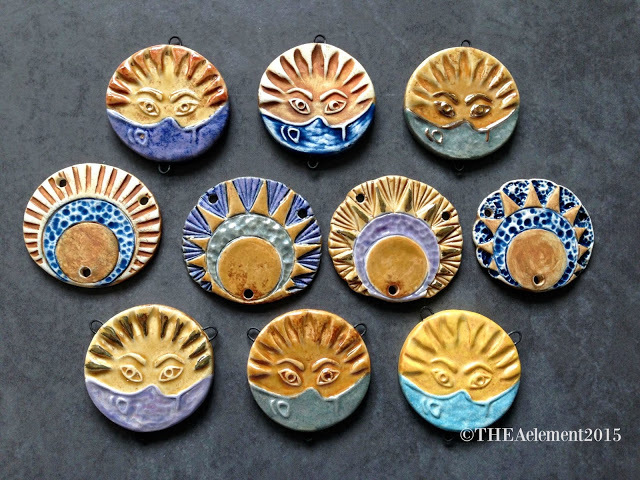 The first thing I did was make some ceramic pendants to put in my shop and made myself break out some yellows and golds for the glazes. Although though I didn’t use any of these in my own design there may be one or too appearing in the blog hop. For my next design I turned to bead embroidery – my favourite past-time of the moment to create this brooch. 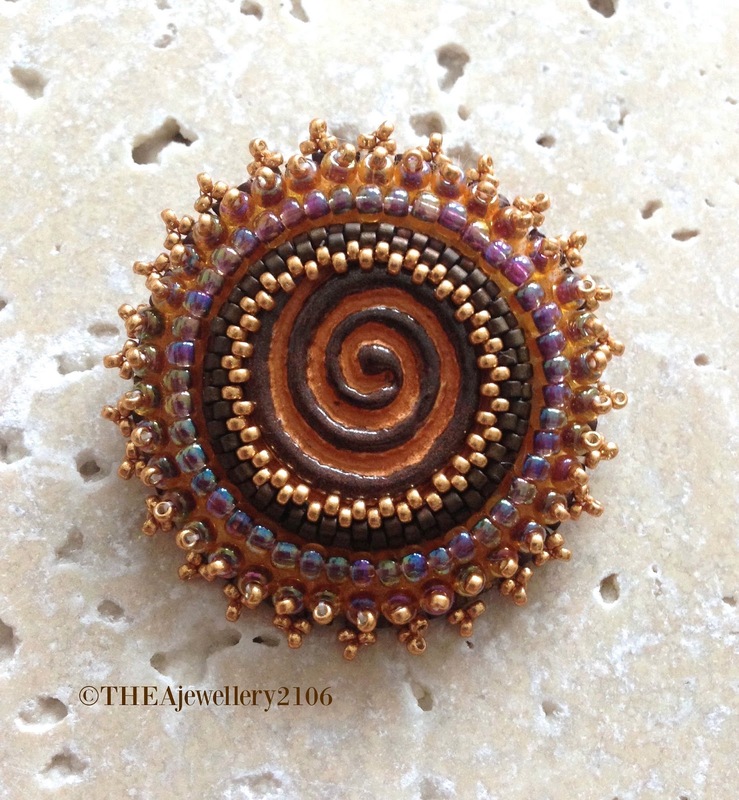 I used one of my own cabochons featuring the spiral symbol often associated with the sun, accented with beads in shades of gold and bronze and with a picot edging to give the effect of sun rays. 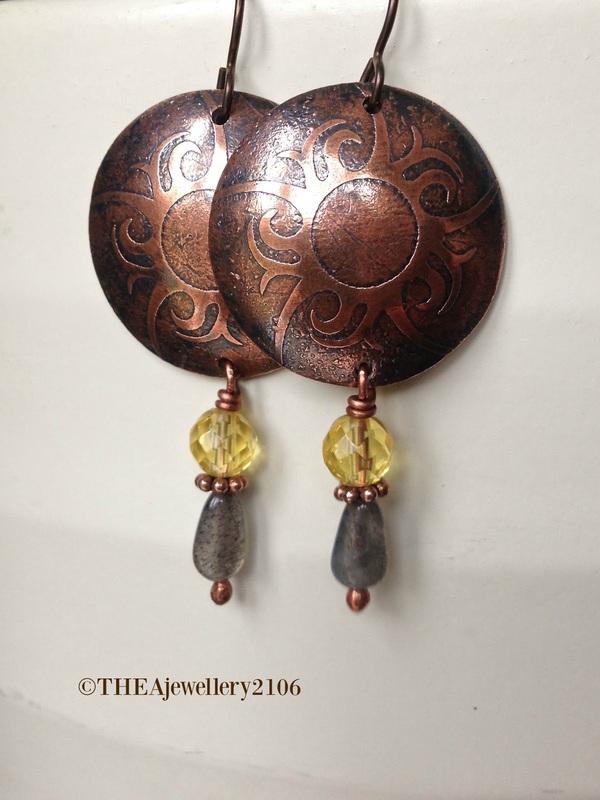 Next up is a pair of earrings featuring a tribal sun design which I’ve etched into hand cut and domed copper discs. 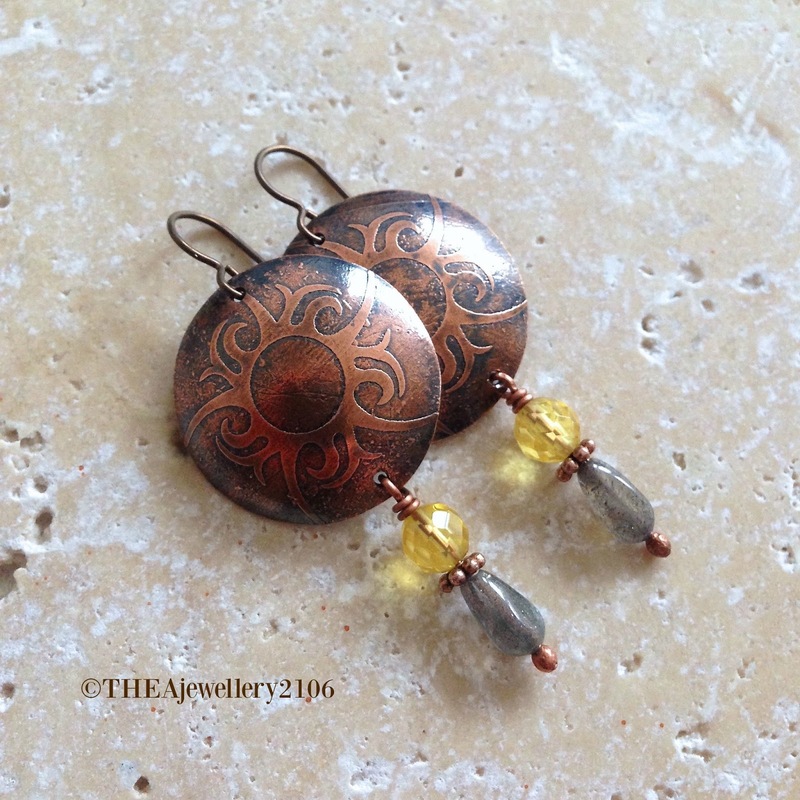 The beaded drops feature faceted Citrine and Labradorite beads – simple but pretty. For my final piece I wanted something a bit more substantial so I decided to make a necklace using a technique I learnt from Jenny Davies-Reazor which combines a cold set bezel and polymer clay. The focal of this piece features one of my own porcelain face charms set in a bezel formed from two Vintaj flower blanks. 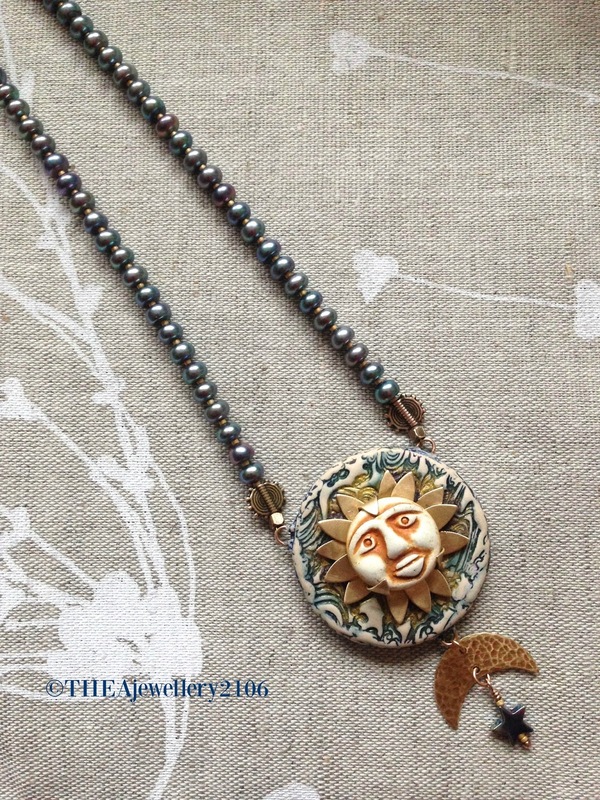 The bezel is attached to a textured polymer clay pendant which has been painted with acrylic and sanded back to create the effect of sky, clouds and the sun’s aura. Because the focal is quite detailed I wanted to stay fairly simple with the necklace so I chose to go with inky blue/purple pearls interspersed with gold seed beads to pick up the hues in the pendant. 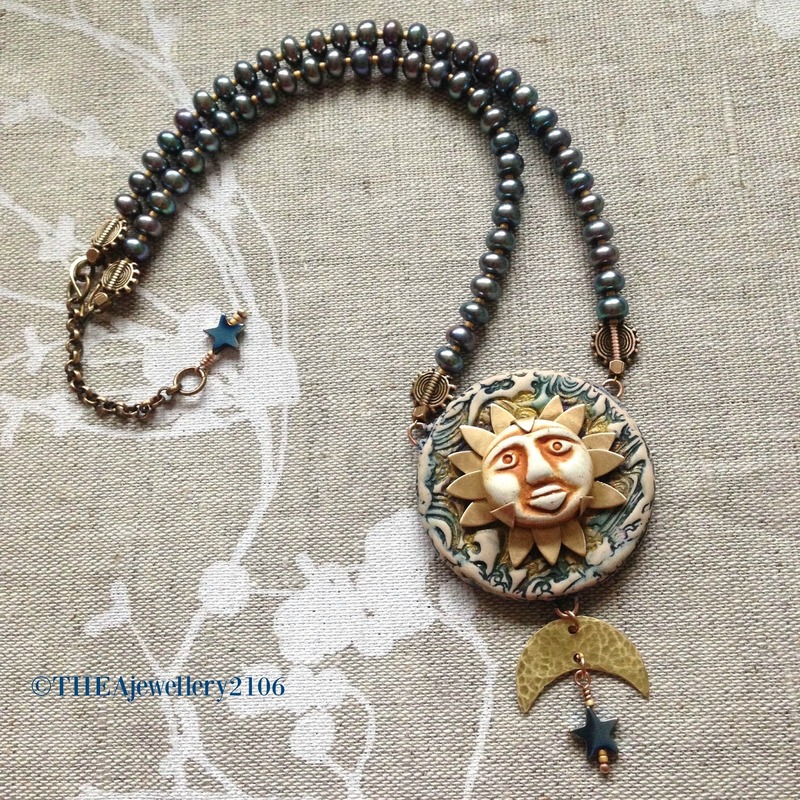 Little brass sun discs add accents at each end of the necklace. A crescent moon cut from sheet bronze and a Hematite star charm hanging beneath the sun signify it returning to the dominant position and another star charm hanging from the end of an extension chain completes the piece. It took me a while to get this one the way I wanted it but I’m really pleased with how it turned out in the end. Please excuse the less than brilliant photo’s – I like to take them in natural light and it’s been in very short supply of late! I’d just like to thank everyone who has taken part in this challenge and I hope you now join me in visiting the rest of the participants to see what they’ve created – just click on the links below.